They have a youthful, confident swagger, ammunition belts draped around their necks, roaring into town in their open pick-up truck. "The White Army", as they are known, calls the shots here. An ad hoc militia formed originally for cattle raids, they are part of the rebel movement that has been fighting troops loyal to the government for the past five weeks. The rebels still control pockets of South Sudan which have been virtually impossible for journalists to reach. But now the BBC has had extremely rare access to one: the small, dusty settlement of Lankien in the north-east of the country. A ceasefire has now been signed between official delegations from both sides in this conflict. But if it is to hold, it will have to be observed in towns such as Lankien. And we found a rebel movement here still baying for blood. Within minutes of reaching the central street, we were surrounded by a White Army huddle. 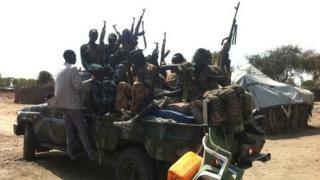 They're young, schooled in battle and mainly ethnic Nuers, targeting the Dinkas of President Salva Kiir. One of the fighters, Taban Sayif, claims he's 28, but looks younger. He sports yellow sunglasses, a beret and the obligatory AK-47. "The White Army came together because the president is murdering our elders, women and children," he says. I ask where he got his plentiful supply of weapons. "We got them, and the car, from government soldiers who we killed," he boasts, before making a gesture of slitting a throat. "And we'll use them until we kill President Salva Kiir." It is bravado for sure. But this conflict has revealed such a depth of hostility that the ceasefire may not hold. It will take time to come into practice. And co-ordinating a disparate rebel group will be tough. In his compound, local governor Tut Ismail Billiu takes shelter from the sweltering heat with his colleagues. But there's little hope: even in the shade, it's 42C. Judging from his determination, he won't be swayed by the peace agreement. He talks of his desire to install Riek Machar, an ethnic Nuer and former vice-president as leader of the country. "We want to overthrow the government," he says "because Salva Kiir is a dictator." South Sudan's war was sparked by a political battle between the two men - but soon tipped over into ethnic killings. "We see it as a tribal fight," the governor says. I ask if it's worth the human cost. "We know people are dying but we need change to come," he replies. "And we believe we can win this fight. We will march on the capital, Juba, and get rid of the president." Until peace comes, the human cost mounts. Up to 10,000 people are now thought to have died and over half a million are displaced. Many of the wounded from far afield - Bor and Malakal, scenes of the worst fighting - now come to Lankien, to a clinic started up by the charity Medecins Sans Frontieres (MSF). It's a lifeline for the patients who have tripled since the conflict began; some walk three days to reach it. Project co-ordinator Angie Carrascal shows me the individual tents, housing surgery, malaria, HIV treatment and a maternity unit. "At first we had no need for surgical facilities but now we have 10 to 12 cases a day, mainly gunshot wounds," she says. "It's a very serious situation in terms of water, food and nutrition. We are overwhelmed but have increased staff here. If MSF were not present, the community would be destroyed." Among the patients are many soldiers like Captain Daniel Puok, who has a bandaged leg and arm and tells me he was shot nine times. "I'm fighting for a reason", he says "and I would do it again." Others, though, were civilians caught in the crossfire, like Gat Kuath Lul, who lies a few beds away. Six bullets ripped through his leg, one severing it at the knee. "I feel pain in my heart when I think of the women and children killed by government troops," he tells me, manoeuvring the stump of his left leg. "Even with this, I'd go to fight to kill the men who did this to me." I ask if Dinkas and Nuers can live side by side again. "Only if Salva Kiir steps down will the war end," he says, "and then we can be one people again." At night, occasional bursts of gunfire fill the star-covered sky over Lankien. Government forces may not come here. There's not much to gain. But with such pockets of resistance, there's little hope of a lasting peace settlement. If the rebels do somehow regroup and the fighting resumes, the humanitarian crisis will deepen. South Sudan was born with great hope from decades of conflict. Now this young country craves an end to its darkest hour.